Carb-Loaded is now available to watch! 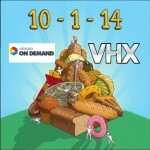 Starting October 10th, Carb-Loaded will be available for rent and purchase from Vimeo On Demand and VHX. You can also pre-order the DVD right here at Carb-Loaded. More options will be announced on our Watch page. As you can imagine we are pretty excited about sharing Carb-Loaded with everyone. We will be premiering the film next month at the beautiful Ridgefield Playhouse. If you will be in the area and would like to attend, click here for the ticket information. We hope to see you there! A Guide to Low Carb Movie Snacks! What Can I Make With This? An FMTV event not to be missed!